Acacia gum (Acacia Nilotica) grows in dry savannas and dry, rocky hills in tropical Africa and the Arabian peninsula. The gum, made from the sap of the plant, has numerous commercial uses as an emulsifying agent in medicines and in most processed foods. It is used as an alternative medicine with numerous purported healing qualities, not all of them proven by clinical trial. 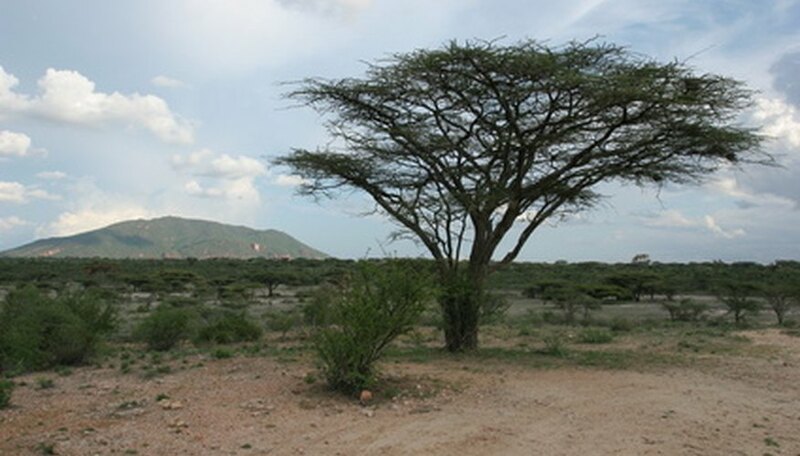 The acacia is a spiny shrub or tree with scaly, rough gray to brown or blackish bark; it grows up to 65 feet high and 4 feet around the trunk. A shrub variety, rostrata Brenan, either branches at the base or grows into a tree 3 to 18 feet tall with a dense, flattened crown and creamy-yellow papery bark that peels. The variety leiorhachis Brenan, a tree with straggling branches, also has yellow, papery bark that peels. Pseudoglaucophylla grows on African sand dunes. Senegal gum has similar properties and has been popularly called acacia gum since the late 19th century. The pharmaceutical industry prefers what is marketed as Kordofan gum, collected in Arabia, northern Egypt and the Sudan. Kordofan gum, commonly called “Turkey sorts” or “Trieste picked,” is whitish, or white tinged with yellow and has fewer impurities than other varieties. The round or oval tears of acacia gum are about 1 inch in diameter and fracture easily into glassy fragments. The tears have a bland taste and no odor. The gum from trees in the Sudan is pinkish or yellow in color; it is more transparent and has fewer cracks than Kordofan gum. Senegal gum is white or red; the tears are larger and have fewer fissures than Kordofan. Acacia trees can survive dry conditions but do not like frost. They do best at temperatures ranging from 60 to 82 degrees Fahrenheit. In the dry season, gum exudes from cracks in the bark of wild acacia trees that are from 4 to 18 years old. Stress appears to induce gum so that attempts to improve growing conditions reduce the flow of sap. Five to six greenish brown seeds are enclosed in a straight or slightly curved brown or gray pod that is 1 inch wide and up to 7 inches long. In the Sudan, trees are grown from seeds produced in special gum gardens. In other areas of Africa, seeds are collected from wild trees. In mildly alkaline sandy soils, the seed should be sowed on the surface. The acacia tree can also be propagated by cuttings of shoots. After the rainy season in November or in February or March, Africans strip the bark of 6-year-old trees to make the sap exude or they tap it by making a horizontal incision across the bark. The sap runs in a furrow from the cuts, hardening as it is exposed to the air. The gum is ordinarily slowly dissolved in two parts of water. It shows an acid reaction when tested with litmus paper. Adding ferric cloride will produce a bluish-black color in gum that has been adulterated with dextrins or starch. Brown or yellow gums contain tannins that are not soluble in water and form ropes in solution; these are inappropriate for medicinal uses. Gum Acacia dissolved in water and strained is used as a mucilage to treat diarrhea and dysentery, as well as inflammatory conditions of the digestive, respiratory and urinary tracts. What Are Indian Cigars That Grow on Trees?